This review contains plot spoilers and is based on the UK broadcast of the episode. Under Russell T. Davies, Doctor Who found a new story type: the celebrity historical. 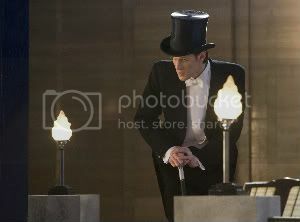 This offered one way of promoting the show; the Doctor meets Charles Dickens, or Shakespeare, or Agatha Christie. An instant hook for critics and viewers. This series opener/midseries returner (delete as applicable) takes all the marketing chutzpah of the Davies era, and then has the guts to deliver something altogether different. Here, the conventions of the Davies-esque celebrity historical are firmly deconstructed. Adolf's not the point of the story, aligned with some evil, alien force as might be expected. No, because Hitler's shut in the cupboard, ridiculed and relegated to the sidelines. Storywise, it's all about the arc, not the Reich. Let's Kill Hitler is the suggestion of psychotic character Mels, never a serious statement of intent. Getting the high-concept marketing frills out of the way, Moffat's unbound and free to tell the story he's really interested in – 'The Beginning of River Song'. Except Hitler-as-window-dressing is also thematically integrated into the tale; after all, his presence motivates the Teselecta and its hunt for war criminals. Following A Good Man Goes To War, we might ponder whether the Doctor himself is about to stand charge, but a storyline paralleling the Doctor and the Fuhrer was never going to secure any Brand Manager's assent. Instead, it's Melody Pond, Kovarian's weapon of choice, who seizes the Teselecta's interest and so narratively displaces Hitler. Giving guilty parties hell, workers for the Justice Department have taken on a God-like status, able to cast definitive judgement and carry out sentencing. As the Doctor remarks, these miniaturised minions seem ever so certain of who they are. By contrast, Melody Pond's identity is fluid and insecure; post-Mels and yet pre-River, she's caught between selves, in a mixed-up state where regeneration energy can magically solve any crisis. The true crime of the Teselecta is to assume that identity is fixed, and that judgements can be final; by contrast, the Doctor doesn't judge, but instead proffers redemption, guiding Melody through the episode's rite of passage and into the mantle of River Song. Pond Junior doesn't have to be the object of Kovarian's scheming. She can be her own subject. She can choose life. And yet one of the most important moments in the episode is withheld – an absence beating at the heart of all this quickfire fun. 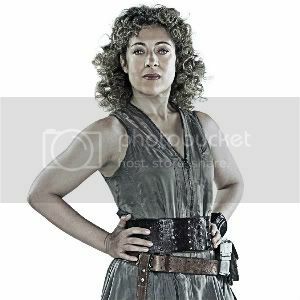 It's not The Question – though silence falls there too – but what the Doctor tells Melody to convince her that, as River Song, she can be so much more than her programming. This seems a bit of a cheat: the storyline requires the Doctor to say something hugely, emotionally affecting... so Moffat delivers the required outcome yet without the speech itself. Perhaps any possible dialogue could never have felt convincing enough; perhaps it's best left as a gap for fan speculation to play with. In any case, going beyond bananas and “spoilers!” this replays yet another Moffat-ism by recalling his previous use of such a device (in Forest of the Dead) where River whispers, unheard by us, the Doctor's name. Here again are the Doctor and River, sharing confidences, with this privacy maintaining the mystery of their relationship. Rather than delivering unadulterated sentimentalism, Moffat steps back and shrouds his protagonists' emotional lives just a little. Unlike Davies, this showrunner seems happier posing questions and constructing puzzles rather than delivering full-blooded emo-bombast. There's a curious reserve, or a discomfort, in relation to the big, predictable, plotted emotion. Or perhaps it's that, for Moffat, the Doctor and River's relationship is one of the show's current mysteries: this is emotion as narrative puzzle. No need to choose between character relationships and story arcs; they're all bound up in the same big wibbly ball of stuff. And though the Teselecta may presume its own Godliness, Moffat throws in another fleeting metaphor: it's also a Star Trek-style crew rendered as a TV production team, complete with costume and art departments, the latter worrying about skin tone. Presumably this makes the Teselecta's captain a sort of showrunner, all key information at his fingertips, resolutely in charge of who's going to be given hell. Let's Kill Hitler thus makes crafty jokes about the showrunner-as-God, ridiculing authority just as it enacts it by setting out new mysteries and tidying away key incidents. We get the crowd-pleasing reversal of "spoilers! "; the first appearance of River's diary; and the beginnings of her archaeological career, as the Showrunner-God ticks all those boxes in rapid succession. Oh, and takes care to explain why River couldn't regenerate in Forest of the Dead, making fanboyishly sure that consistency is the mother of invention. In the end, Let's Kill Hitler is a front for "Let's Find River", with the celebrity historical drawing audiences in for a story focused more strongly on the "TARDIS family" (Amy-Rory-River-Doctor) than ever before. This episode represents a Teselecta of showrunners; Moffat's finest shtick standing behind the eyes of a Davies era staple. Matt Hills is the author of Triumph of a Time Lord, and is currently reviewing Torchwood: Miracle Day for the Antenna blog. It is quite something when a series with so many known parameters and constituent elements can still be juggled together and delivered in a fresh manner. 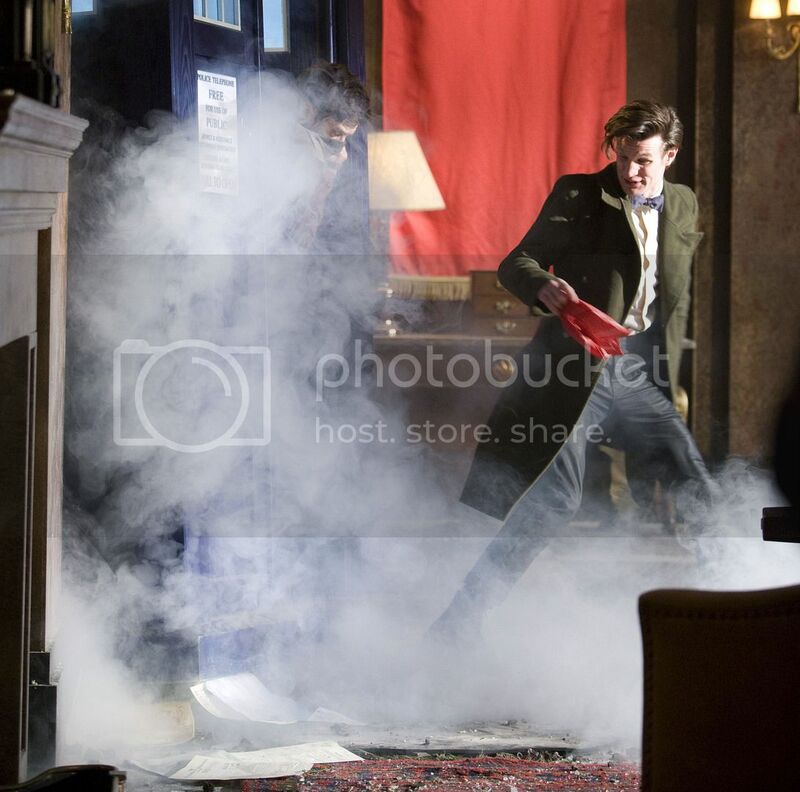 And yet Steven Moffat once again manages to do just that in Let's Kill Hitler! For instance, regeneration. Back in The Christmas Invasion we learn that Time Lords are in a state of flux during the first fifteen hours where-in their bodies can 'regenerate' any damage. Then, in Journey's End the Doctor reveals that residual regenerative energy can be siphoned off into an appropriate vessel. 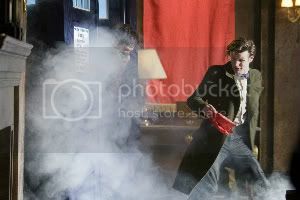 For Let's Kill Hitler, Moffat skillfully revisits those ideas in the form of River, at one point reveling in her ability to shake off a hail of bullets, and then ultimately channeling her own energy into the Doctor to save him. Then, for River herself, the signposts were pretty easy to read that the little girl from Day of the Moon was going to be her, cemented in A Good Man Goes To War with her being conceived in the time vortex within the TARDIS; but then not only does Moffat play a neat trick by having us first think it is River in the red corvette at the start only to see Mels instead, reveal her as a childhood friend of Amy and Rory, only then to further reveal it really was River after all! (why didn't I pick up on the name "Mels" straight away?!!!). Not only that, Moffat also gently guides us into preparation for the possibility of a black Doctor! The stuff with Hitler was amusing, especially as the eponymous character is actually only a comedy sideline - though he did of course play a pivotal role in "killing" Mels, which is quite ironic considering it was her suggestion to go kill him! And of course nobody knew the Teselecta crew were also there for similar reasons! As usual with Doctor Who, it is so easy to be taken along for the ride from beginning to end, and the cracks in the plot are easily plastered up by the sheer pace and display put on. One crack in particular that stuck out for me was quite how Mels ended up where she was. We see the young Melody regenerate into her at the end of Day of the Moon ... but this was in 1969(ish) and River says she only changed this once, so how did a young black girl get from New York City to Leadworth, not to mention being "born" at least couple of decades before her parents? Time Lords (should we call her that?) may age differently from humans, but then she seemed to match up with them rather well. Mind you, this could be a previously unknown facet of Time Lord physiology that they can control how they age (possibly borne out by an aside by River on getting younger tonight?). But that's a minor niggle in amongst the gems, especially in the acting. The interplay between Matt Smith as the Doctor, and Nina Toussaint-White/Alex Kingston as Melody was great fun, and I should also mention Caitlin Blackwood being as enchanting as ever as both the young, innocent Amelia and the TARDIS's voice interface - "fish fingers and custard" was worthy of a great cheer! On the other hand River goes from strength to strength. The wibbly wobbly timey wimey way in which we've encountered her has been one of the most fun elements of recent series, and now we have her arising phoenix-like into the Doctor's life for the first time (her perception). And full credit to the consummate ability of Alex Kingston to bring River 'to life' as someone totally ignorant of who she will become to the Doctor (and us) yet the little quirks of her personality we know and love literally evolving as the episode progresses. There are still some big gaps in her life though, but these quite possibly will feature in future storylines! And I'm looking forward to them! So here we are in 1927 New York, which means that Jack's infiltration mission with the Night Travellers in the 1920s must have come to an end - this is plausible I guess, in that the only date we have for that setting in series two's From Out Of The Rain was 1925 and that isn't tied directly to Jack. However, I was surprised how his American accent caused little concern for someone arriving in America on a UK passport (which was authentic in that the style came into use in 1920 ... though I couldn't tell if it was a 1927 "Northern Ireland" or earlier "Ireland" version!). But why is he wearing his modern day coat? The story implied that this is Jack v1, i.e. the one who originally joined Torchwood in the late 19th Century, but with that coat here did he actually go back in his timeline yet again in some future Miracle Day revelation? Or am I now desperately looking for some plot rationalisation over how he came to be dressed that way? Once again we have an episode that says a lot but doesn't do much. 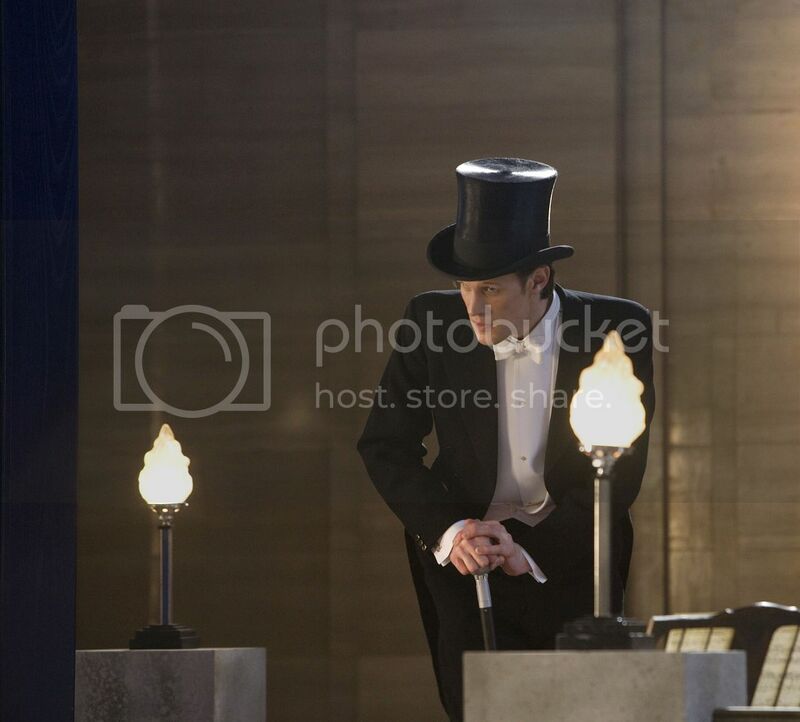 About all we learned from the episode was that Jack had a relationship with Angelo, and that back in 'our time' it seems Angelo is still about and wants Jack dead - or is that by the other three instead, who wanted 'ownership' over Jack in 1928 (and who happened to clasp hands in the now familiar triangular symbol/logo the Miracle protagonists use on their phones etc. - an important plot clue?). However, whilst the plot itself might be shaky, character-wise the episode performed well with an interesting exploration of Jack's view of the ephemeral nature of his relationships with us mortals; as mentioned above, though, it isn't clear if this is pre- or post- Ianto Jack - if he had only been on Earth for some 40 years so far would he have had that many relationships? Still, as other reviewers have observed, this series does seem to be concentrating on Jack's male exploits (and possibly some slash-fiction asperations on the part of the writer who handled both these encounters this series?!!). Not that this matters to the story per se, but it does feel neglectful of the character's inception as an omnisexual 51st Century guy (something that River seems to have taken up the reigns of in Doctor Who, judging by her anecdotes!). Speaking of which: okay BBC, so what standards are being applied for scene censorhsip in Torchwood? Episode three sees a brief scene cut from transmission for its sexual content, but episode seven sees a much longer, explicit scene broadcast at an earlier time than the previous excised one, plus what seems to be male anatomy on show! So why bother trimming episode three at all? (unless there was a problem with Vera and Rex?!?!). Also, the scenes with Jack and Angelo inter-played well with what looked to be a bitter parting between Jack and Gwen in the car as their own relationship descended into distrust and seemingly ready to annihilate each other to protect their lives. These were again great scenes, but it was all so neatly forgiven and forgotten at the episode's climax that the whole emotional impact was somewhat undermined. Still, yay for Esther for lighting up the screen for those few moments she had this week, and for being the one who sussed it all out yet again, saving everybody in the process. The true heroine of the series! Anyway to summarise, we had some great character scenes (with good acting from John Barrowman and an even better performance from Daniele Favilli! ), but little to further the overall storyline; I know sometimes it is good to take a breather from the action (a problem with some Who episodes is that you don't get a chance to breathe) but not for several episodes in the same series! (and, having had Nana Visitor for a minute in this episode, let's hope "Next Time" John De Lancie gets a bit more screen time, not to mention a meatier role ... but episode eight and another previously unheard of new character pops up?!!). 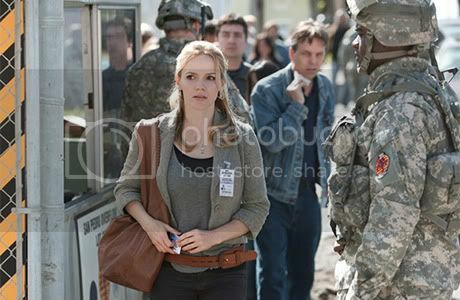 This review contains plot spoilers and is based on the US broadcast of the episode. From the beginning of this episode addressing the state of suicide, to the ending with a non-apologetic government, ‘The Middle Men’ hit home with its excellent social commentary. This episode finally focused on the Torchwood team and didn’t deviate to include the other subplots. I especially enjoyed the break from Danes and Jilly. The show is much more enjoyable when the team is focused on something together, even when it’s not on a single mission. And though it was frustrating to still have very little of the ongoing plot revealed, except that PhiCorp is in the dark about the Miracle, the overflow camps became public and out of Torchwood’s hands, thus finishing one part of the plot. Through Maloney we saw a bad person do bad things. His decisions, to incinerate Vera, to slowly stab Rex in the heart, to kill whoever was in his way to protect himself, were above and beyond a person reacting to fear or just following orders. He created suffering in the overflow camp, and rather than face the consequences, he murdered and tortured. He didn’t regret the murder, he was simply afraid of being caught. On the flip-side we have the doctor Gwen confronted. She was a good person doing bad things. Afraid of the changing world, she didn’t know how to keep her profession afloat in the impossible situations of the Miracle. She did not send people to the ovens for any personal reasons, but was doing what she was told and hoping that the leaders she trusted were choosing the right thing. Gwen confronted her on this form of evil, the banality of a good person just following orders, and though distressed, the doctor stuck to her defenses, refusing to blame herself. Jack’s search for answers continued this commentary. He found no man behind the curtain, but instead discovered a convoluted and sprawling system, completely masking accountability. There was no one to blame, just a chain of people who did their job without any context. Though someone is pulling the strings, they’ve hidden themselves in the actions of the whole world, an invisible puppet master. I’d still like to see the answers to the plot come out faster, and I’m looking forward to seeing the team working together in person, rather than in goal. But this was an excellent episode in both its delivery and characters. (I’m still annoyed that Jack is only presented as gay, though. Where’s the omnisexual 51st guy we all know and love?) But the depth of thought in determining the world’s response to the Miracle, now creating a modern-day Holocaust along with all the moral implications that follow, continues to be outstanding. I can’t wait for the next episode, one that unmercifully pulls Gwen between Jack and her family. Finally, an episode that 100% felt like Torchwood - a strong story and strong characters, along with a horrifying plot development. Now we see another part of PhiCorp’s plan. It’s taking a chapter from the book of World War II: people receiving categories to define their life and furnaces to deal with the most unwanted. But knowing what little we know of PhiCorp, controlling the healthcare of practically all humans through the overflow camps might not be for the simple reasons of money and power. With the cryptic mentions of who controls the company, along with the Time Lord technology stockpiling the pain medication, this points to something more than just typical human greed. But whether it’s an alien influence, or humans with access to alien technology, has yet to be seen. The more interesting aspect is that the rest of the world, in a time of crisis, is willing to go along with PhiCorp’s plan, stick their heads in the sand, and not ask questions. It’s a classic Russell T Davies social commentary on the evils any person can perform. The final reveal of the horrors of the overflow camps centered around Vera’s murder, which was about as horrifying as Torchwood gets. Since people don’t die, presumably ever, she would have been aware and conscious up until the point her brain was ash, if not longer. And Rex could only stand outside and watch, and film. Her death was also wonderfully gutsy, and well done. Her arrogance at assuming she would be allowed to walk out of the overflow camp after threatening to prosecute, and then disbelief at getting shot, was good writing and good acting. I didn’t think Torchwood would kill anyone off this early in Miracle Day, but the writers went ahead and took the plunge. It’s not bad or good - Torchwood has a habit of doing this and as long as they don’t actually kill off anyone from the first three seasons I’m past the point of caring. It will be interesting to see how Vera’s murder warps Rex, especially if he blames Esther and Jack for letting Vera join the mission, and what he does with the video footage. If viewers had any hope for Vera still being alive, Jane Espenson comments via her Twitter account: "burning means you really really are dead". As for the rest of the episode, no complaints. Jack anticipated Danes’ true wish of wanting to die, and got it wrong. Danes’ speech and the crowd’s disturbingly supportive response was an expected continuation of his plotline. I really like how they’re tying Jack and Danes together, and it will be interesting to see how Jack ultimately deals with Danes, or possibly vice versa. Gwen’s slapdash run-in-and-rescue approach with her father hurt rather than saved him, and for all of Gwen’s self-confidence and experience, she still has to learn to look further ahead at the consequences of her actions. This was a good episode, and I look forward to the next. Torchwood: Miracle Day - Escape To L.A. This episode was also strong, but moreso in characters than in plot. Plot-wise, the mystery continues to be revealed tantalizingly a piece at a time, and this episode didn’t reveal enough to satisfy my curiosity. Very little was explained about the plot - only that PhiCorp is being run by some invisible force and creating overflow camps for the undead who wont heal. Because the plot of the episode mostly focused around a mission that ended with a cop-out shot-just-before-he-could-say-the-name-of-the-bad-guys moment, the episode felt like filler. Thankfully Danes’ storyline saved the day and continued its progression from disturbing to extremely disturbing. The entire ‘Dead Is Dead’ campaign was a fascinating example of the perspective people could take to the Miracle. Danes’ choice to go into the hospital and set himself up as a messiah-like figure for the despondent injured and ill was a perfect counter to Ellis Monroe’s campaign and values. Watching him inspire hope in people was downright creepy. I can’t wait to see his role as the messiah of the Miracle unfold. Jilly’s sheer joy at his actions was fun comic relief - she knows PR, and true to her profession, she loves it when someone pull a good PR play. Her scene where she tells Danes how much she can’t stand him, especially to even look at his hands, was a great piece of character development for her. Up until now she’s just been this agent with no soul or personal opinion and completely focused on the job. That moment reminded the audience that though she’s working for PhiCorp and on the ground level of the Miracle, she’s still just a puppet and not at the top of the foodchain, a very human puppet who knows exactly what she’s doing. Though she might be the ‘devil walking the earth’, she still has some morals, just ones she sets aside for her job. As an American, I’d like to make note that mayor Monroe was part of the Tea Party. Oh Russell T. Davies. That man loves to knock on America’s right side of politics and glorify its left. Cases in point: the stupidity of President Winters in the season 3 finale of Doctor Who (granted, everyone mocks him) and President Obama’s plan that would have saved the world from financial crisis in the final David Tennant Doctor Who specials. Though it makes a lot of sense for someone of the Tea Party to come up with a campaign like ‘Dead Is Dead’ since it relies on a fairly religious fundamentalist view of the world, I just find it funny to see Davies’ ongoing biases in his TV writing. I’m completely fine with his bias - he’s not a journalist, and since I love his writing that means I want to see his biases since those are quintessentially a part of his writing. I just find them funny since they’re so blatant and don’t actually need to be in Doctor Who and Torchwood at all for the sake of the stories. Going back to the episode, I also loved the character development we gained with Rex and Esther, especially because the focus was on family. Rex visited his father because he’s scared, though he wont show the rest of Torchwood. He should have died and he knows it, and he wanted to hear, “I love you son and everything is going to be okay.” Instead his father was still just angry, refusing the olive branch and hammering another nail into the coffin of his relationship with Rex. Rex tells his father that he died, and his father doesn’t care - Rex’s expression after that moment was just so sad. And Esther’s decision to report her sister, Sarah, to child services was equally heart wrenching, especially when it led to her sister’s children being taken away. It was a hard choice with unexpected repercussions, and the actress and the writers portrayed this very well. These back stories are continuing a running theme in this season of Torchwood - family. 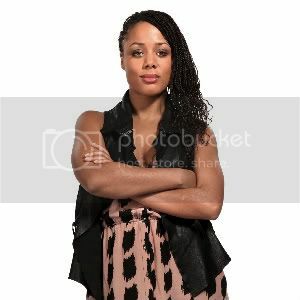 Along with Rex’s father and Esther’s sister, Gwen is willing for Rhys to put himself and Anwen in danger to protect her father, and then her father becomes tied into the plot as he’s sent to one of the overflow camps. This family life even extends into the mission, with Esther placing the whole Torchwood team in danger by visiting her sister’s house in person and then becoming an emotional wreck due to her phone call to child services, and Gwen actually talking to Rhys on the phone in the middle of the mission. All this presence of family brings the Miracle and the nature of Torchwood home - though all this is a ‘big picture’ issue ultimately it affects people, and though the Torchwood team might have to act like spies and super heroes, they’re still people who at the end of the day have families. But this presence of family also highlights Jack’s lack thereof, made even more jarring in the hilarious but also bittersweet scene where Jack and Gwen pretend to be an obnoxious couple to gain the biometrics of Nicolas Frumkin, the PhiCorp engineer. Watching them hold hands was a sad moment of what might have been. Jack has no personal stake left in this world, except Gwen. This focus on family is again showing Jack’s isolation. It’s setting up whether or not he wants to die.